Whether you’re upgrading to a new pedalboard, switching over from an all-in-one digital unit, or getting your first pedalboard, there are endless options. The aim here is to give you the info you need to buy or build a pedalboard that will work for your situation. I never knew the Pedalboard Planner tool existed, and it's a hugeee help, so thanks for that! 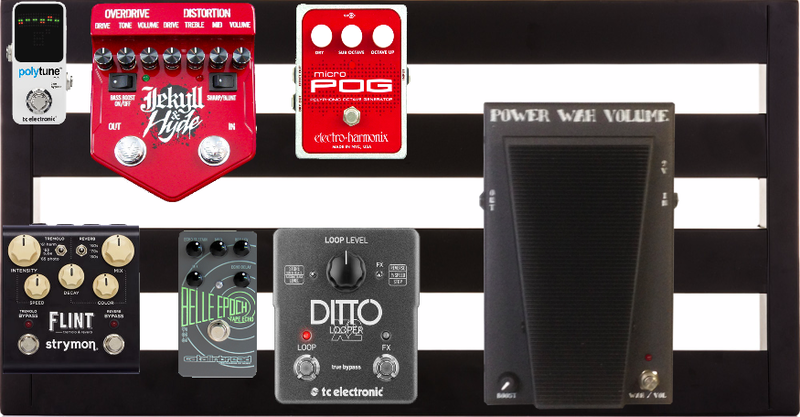 So far, here's what I got, in the order I plan on using them : Visual Sound Jekyl & Hyde, EHX Micro POG, Morley PWV, TC Ditto X2. I plan on adding a PolyTune Mini (to start the pedalboard) and, most importantly, a Strymon BlueSky or Flint to finish the board off (I'm in LOVE with those pedals, but they're so darn expensive, especially here in Europe...). Quick question: do you know if I need a transformer or multiple power bricks for when using the pedals in Europe vs the US? If there are pedalboard power supplies that can run at dual voltages, I'm not aware of them. I think the best bet is to buy pedals and power supply in the U.S. and then get a transformer to step the 220V power in Europe down to 120V. I would check with the power supply manufacturer about what exactly is needed first, though. You don't want to accidentally fry anything.